I wasn't quite sure to start with what I was going to do, I did want the flower pendant to be the centre piece of a necklace so wanted to keep it simple to show it off, other than that it was a bit of a blank canvas so to speak of what I would do with the beads! Quite a girly bracelet for me, I teamed Caroline's bird bead with the 2 pink rounds from Lesley and added some gorgeous pink faceted Czech glass rounds with hematite spacers, finished off with a black Vintaj hook and a couple of flower dangles and the leaf. When I had first seen the sari silk I had the idea of a wrapped bangle, but then as I played around with the flower focal I decided upon a wrapped bar for the focal to hang from. Here's my second piece, I think I'm pleased with it, I wanted a bit more of a chunkier chain but I didn't have any in my stash. What do you think? I wrapped a length of patina'd thick copper with the sari silk and wire wrapped the ends to make it more secure, from the same thick copper I made a hook clasp. I had a set of lampwork beads in a similar blue with pink/purple frit and wanted to work them into the design but when I linked them into the chain it looked too busy, so I kept just one to hang the flower focal from. To balance the hook I wrapped the purple bird with the blue donut bead and added them to the opposite side, finished off with the copper trace chain. 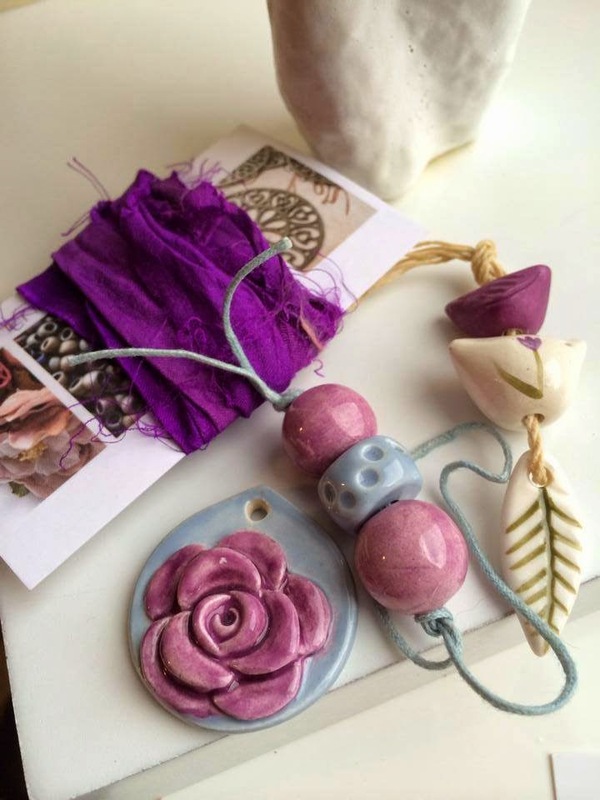 Thanks for joining me and taking a look at my pieces, I enjoyed taking part and would like to thank both Lesley and Caroline for organising it and making the beads and also to Claire from Smitten Beads for supllier the gorgeous sari silk. I hopefully will take part in a few more challenges in the future now I've done my first one and it wasn't too painful! 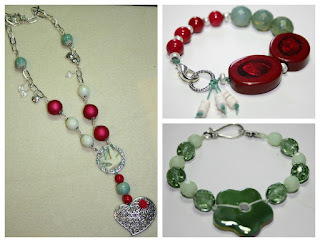 Please do take a moment to have a look at my fellow challenge designers blogs and the designs they came up with their beads! 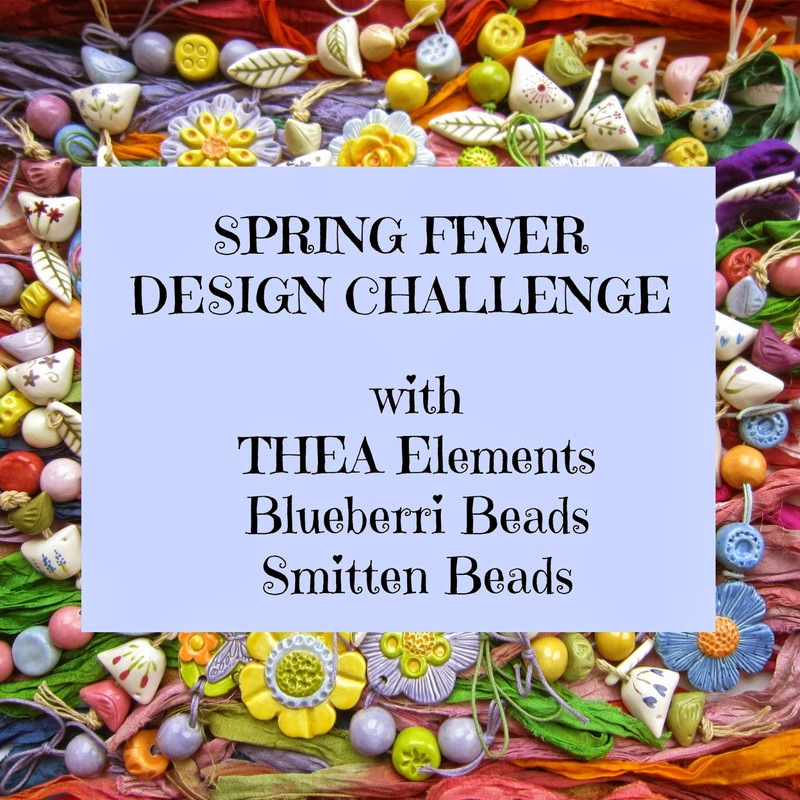 So I've been a bit brave and signed myself up to the Spring Fever Design Challenge ran by Lesley, The Gossiping Goddess, Caroline of Blueberribeads featuring beads of their own design and gorgeous sari silks from Claire of Smitten Beads. I was one of the lucky 20 people chosen to take part - Yays! I thought at first then the eek! set in. My gorgeous beads and silk arrived last week and I have been looking at them ever since hoping that inspiration and an idea will hit me! The reveal date is the 16th of April so I have a little while yet! 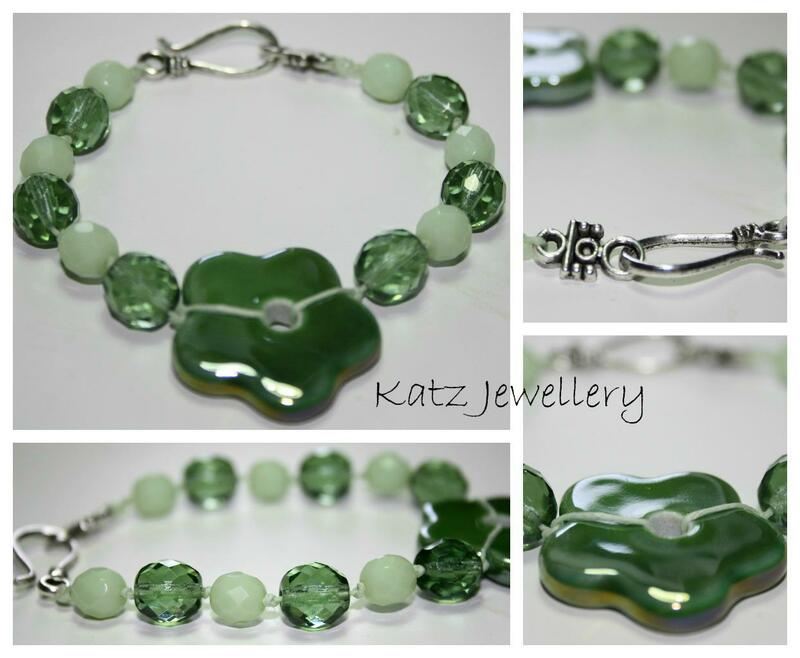 I've been very lucky and have found lots of artisan jewellery component makers through Facebook and Etsy! I love using at least one item in a piece as it gives that item a little bit more soul and love and hopefully shows that I'm not just churning out jewellery to sell! I thought I would show you some of my favourite pieces that have artisan components and that have sold. Wow! it's been over a year since I posted anything here! Ops, so much for trying to post something regularly! So whats happened in the last year .... well I've attempted to take better pictures of my pieces, attempted to learn new techniques and be a bit more creative! 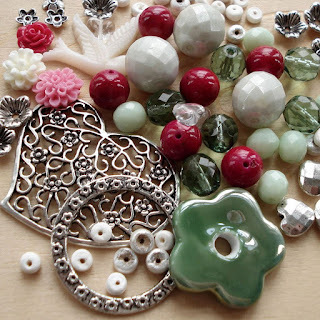 I've bought lots (and lots and lots) of beads, found lots of new artists to buy from (wish I could win the lottery)!! 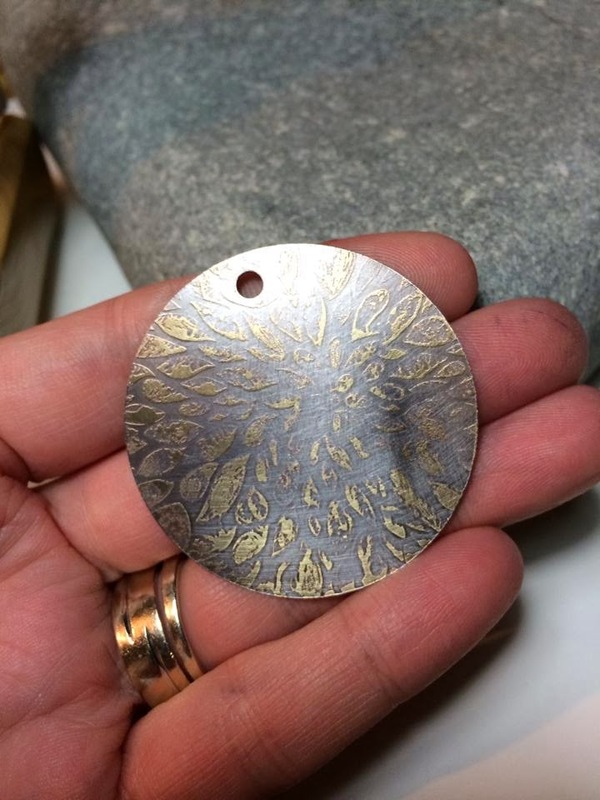 At the moment I'm intrigued by metal, so have been playing with punches, textures and changing the colour of metals! I've quite enjoyed metalwork and some of the pieces I've managed to create! 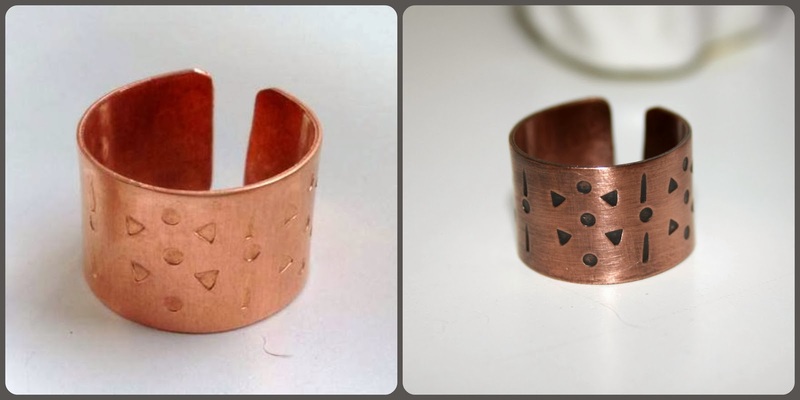 This is a brass bangle that I have patina'd with a mixture of salt & vinegar crisps and cider vinegar, left the bangle in the mixture for approx. 16 hours to get this effect! 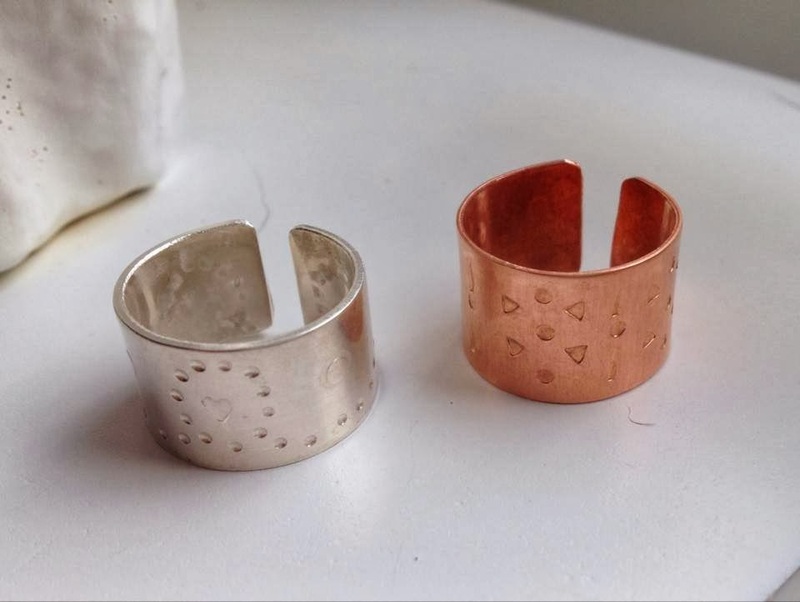 I attended a 1 day "Silversmithing" workshop in October, which taught the basics of metal work, we made 2 rings one in copper and one in silver. I'm not keen on the bright copper colour so I patina'd the copper ring in Liver of sulphur to get the aged look - I think it looks much better and shows the punched pattern more! My jewellery can be bought in my Etsy shop: Katz Jewellery or check out my Facebook page to see what I'm up to Katz Jewellery. 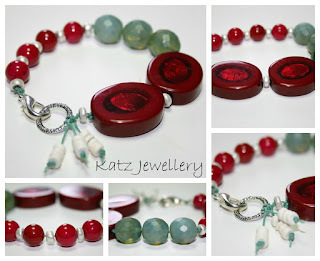 I recently took part in a Valentine challenge with some of the members of the Smitten Beads group, they're all wonderfully talented ladies, so I was quite nervous! 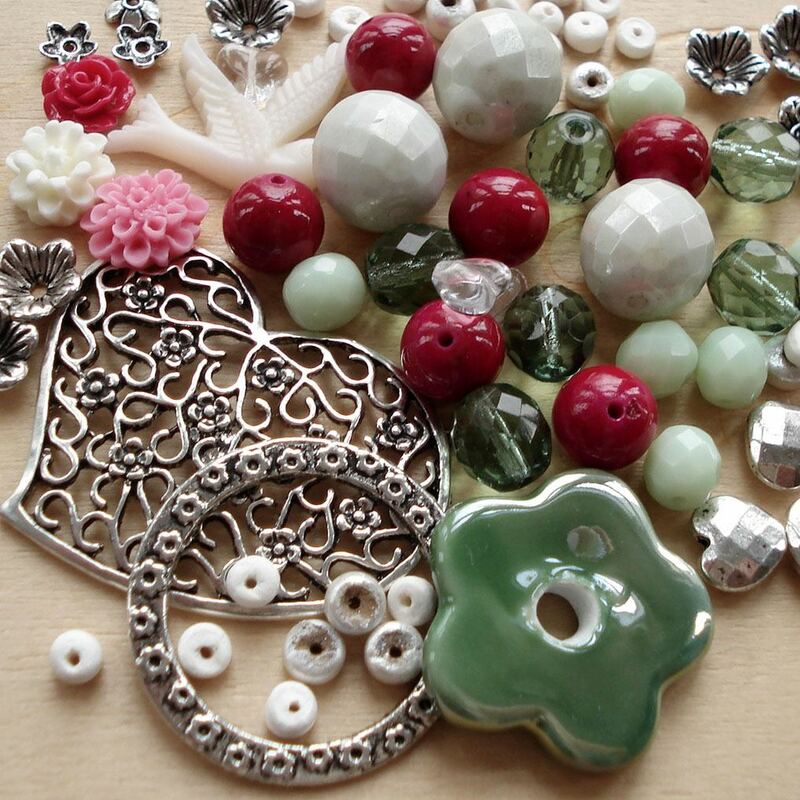 As you can see the pack was full of gorgeous beads and a great colour combo! Straight away I saw some combinations I liked, the only bits I were unsure of were the resin flowers and the dove! I was really pleased with how the bracelets turned out particularly the top one (Red and Green), as it was a slightly different design for me! The necklace lacks a little something - I'm not sure what and I will probably break it down and remake it. I really enjoyed being part of the challenge as it made me think outside of my comfort zone and try different things! I will definitely be taking part in more challenges!